I don’t know in what romantic ways I imagined I might spend my time as a new author. Maybe wistfully staring out at sea … from my Brooklyn apartment window. 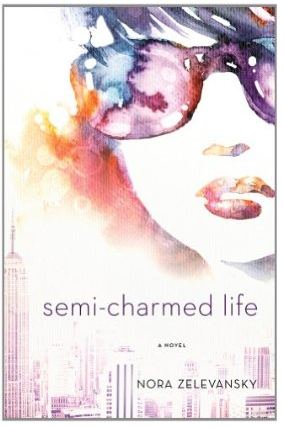 In reality, I waste hours (between trips to bookstores to stare without purpose at copies of my novel on “New Paperbacks” tables) checking various websites to gauge how Semi-Charmed Life is fairing out in the world. Occasionally, I’m rewarded with a new positive rating or review or a low Amazon Rank (which I recently wrote about authors obsessively checking for The Huffington Post), but most of the time I’m just staring at numbers, having no real sense of what they mean. So, last week, when I awoke to find an email in my inbox with a link to the above from my friend L.T. (the blogger behind Hollywood Housewife and also the wonderfully generous person who threw me an amazing LA book party), I was thrilled. 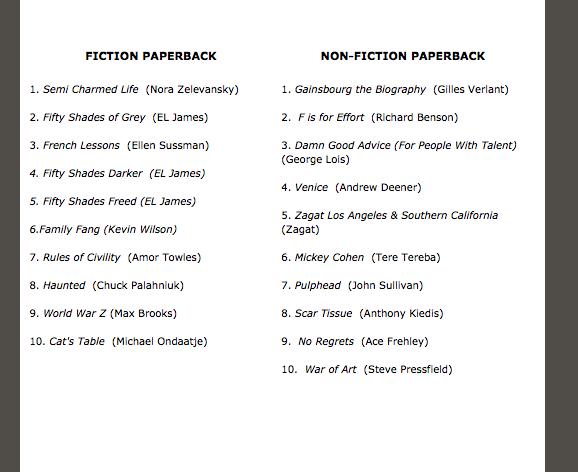 Basically, Book Soup, which is one of LA’s treasured bookstores (yeah, people read there too—A LOT), posted their weekly top sellers on their site and my book topped the list! Finally, a metric I could understand! Of course, I was beyond excited. So excited, in fact, that I stopped checking Amazon … for at least a few extra hours.